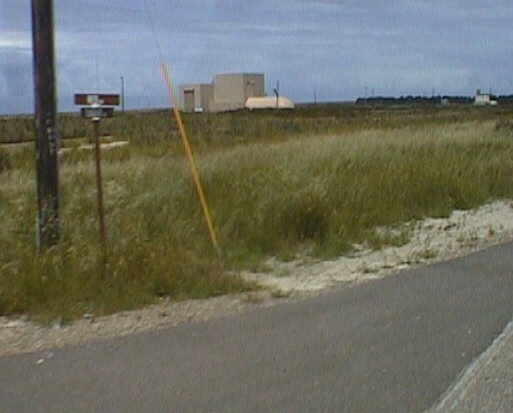 We took the regular Wednesday tour of Vandenberg on June 3, 1998 (as of February, 2003, tours are only given on the second and fourth Wednesdays of the month, and are strictly by reservation -- call 805-606-3595 for details). The tour is worth taking. They bus you from the gate through North Base, past the Delta II launch pad, to SLC-10, at which the Thor ICBM was originally tested (Delta is derived from Thor, by the way). Along the way, you can see an old Atlas pad in the distance, and the facility in which the Reagan-era truck-based ICBMs were developed. At SLC-10, they have a Thor ICBM, a Thor-Agena (used in the early spy satellite programs), and a Bomarc long-range interceptor missile. A museum is being developed at this site by the facility manager, Jay Pritchard. Jay is a great speaker, and clearly enjoys his job, which includes narrating/guiding the weekly tour of the museum. The museum contains models of a Titan ICBM silo/control room, control panels from Minuteman, Atlas, and Titan launch facilities, rocket engines from Thor, Titan, and other vehicles, an Agena upper stage, a Minuteman lower stage, models of "reentry vehicles" (nuclear warheads) from Peacekeeper (MX) missiles, some of the bumpers used to protect the Peacekeeper during ejection from its pod at the start of the launch sequence, etc. They also have some of the apparel worn by fueling crew. There's a blast door from a Titan crew pod (100% manually operated). There's hardware galore, and several good stories to be heard. After the museum tour, they bussed us back to the brand spanking new restaurant/ballroom facility for lunch ($5 apiece for tri-tip steak sandwich, chicken caesar salad, or chef salad), during which the tour guide narrates a slide show of some of the good stuff that the tour does NOT take you to see. In particular, they do not drive you over to South Base, where SLC-6, the stillborn shuttle facility, resides (the tiny, solid-fuelled Lockheed-Martin Launch Vehicle, renamed Athena, now launches from a stool on top of SLC-6). Instead, you get slides of this gargantuan facility, which is 15 miles away. After lunch, we went out to the lawn, on the east side of the restaurant facility. Our guide turned up her radio, and we listened to the various prelaunch events for the GT-167 Minuteman launch to Kwajalein. There is no counting backwards, just a sporadic litany of events, culminating in the call, "first stage ignition." (No exclamation point. The call was just another event.) I heard the call, but nobody else seemed to. I echoed it and everyone started swivelling their heads, to try and find the missile. A 1,500 foot overcast had moved in, so there wasn't much time to view the missile as it punched into the clouds. I saw it for perhaps 1/2 second. Then, there was only a short column of solid rocket fuel smoke, only slightly whiter than the clouds. The most surprising thing, to me, was that there was nothing hush-hush about the launch time. The published window was 1:01 - 7:01 PM. When I called in a couple of days before, I was cheerfully told that the launch was scheduled for 1:00. Sure enough, it came off a minute or two before that. I guess it's just the military satellite launches that are played close to the vest. Missile tests are apparently always scheduled to go at the opening of the launch window. 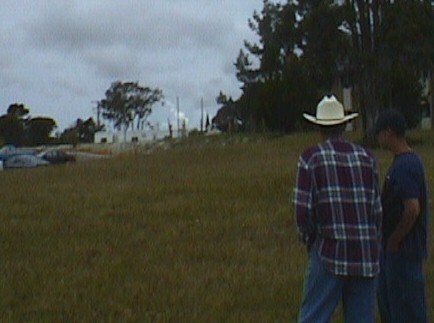 Building used for Pegasus XL payload installation and launch preparation. This is near the VAFB runway. 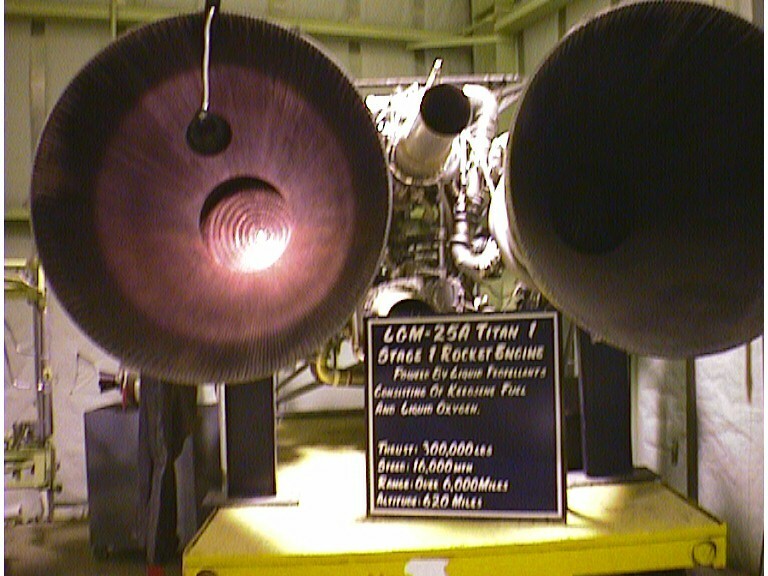 Inside the SLC-10 museum: A Titan I, hypergolic-fueled engine. Notice the combustion chamber's injection head, illuminated in the center of the nozzle. Hydrazine and N2O4 are brought together at this position, and spontaneously combust. 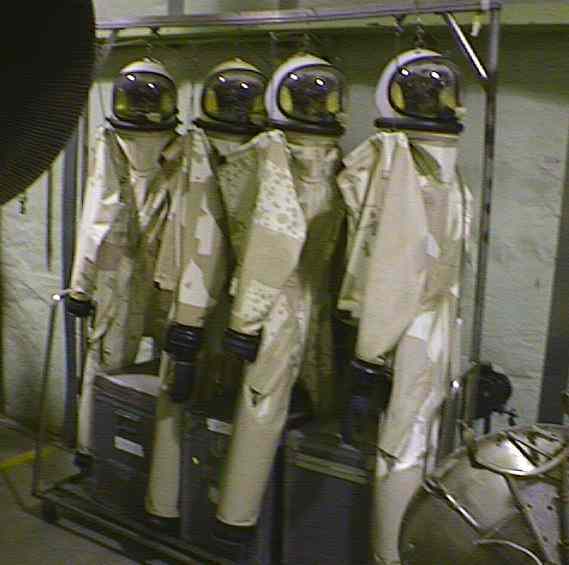 Hypergolics handling suits. Titan fuelers would wear these over long underwear that kept them warm against the cryogenic oxygen used to keep a breathable atmosphere in the suit. Notice the mottled appearance of the suits? Those are not photographic artifacts -- they're patches in the suit. These hypergolic fuels are seriously toxic, especially the oxidizer, N2O4. Minuteman III launch that occured while we were there. Where is it? It's that lighter puff of smoke at the right of the small tree. Hard to see against the clouds? Yes, it was. The bird was visible for only a very few seconds.